​Over the years of hard work, care and dedication, we have been very fortunate to have hundreds of happy and satisfied clients. Our team invites you to take the Himalayan journey of a lifetime. To those who have Nepal on their wish list, we believe that the time is now to enjoy it. We hope that you will recommend our services to your friends, and family. There's a reason the Nepal Trekking motto says, “Once is not enough”. We would love to see you return to Nepal, and people in Nepal never say “Good bye”, instead be we say "See you again". To the left is a letter from Geoffrey Tabin, at the time he was an Associate Professor of Surgery and Ophthalmology at the University of Vermont, now he is Professor of Surgery and Ophthalmology at the University of Utah. He is also the 4th person in history to have climbed the seven summits. 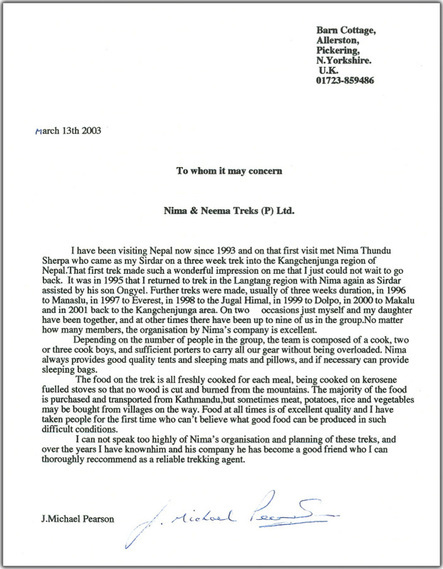 On the left is a letter written by Marc Démolis, a mountain guide, and manager of the travel agency Le Pays D'En Haut. Beneath is a letter by an avid trekker J. Micheal Pearson. "My whole experience was more than I could have expected it to be. I will be hoping to convince others I know who enjoy the outdoors, to consider making the same trip." ​"Our trip to Nepal in October 2018 with US Sherpa International was the trip of a life time! Our group of seven women, ages 53 to 75, included a three day trek to Annapurna region, and many cultural and spiritual experiences in Kathmandu and Pokhara. Working with Ongyel and Tenzing, who was our steady guide throughout the trek, was a wonderful experience. We were greeted at Kathmandu airport with smiles, and excellent care was given for the entire trip. Many thanks to US Sherpa International!" "I am about to go on my fourth trek with US Sherpa and Neema Treks because they are the most sincere family-run, Nepali-based trekking outfit who share my passion to "leave something behind" for the good of Nepal, and each trekker, on every trip. They flexibly empower you to spend invaluable extra time taking in the beautiful Tamang, Gurung, Sherpa and other cultural villages, or to probe Annapurna conservation and Buddhism practices along with majestic sunrises." Send us your testimonial, and you could see it here on our page, or maybe even our slideshow! ​Click to find our email.